*This article first appeared in Scott's Monthly Stamp Journal, April 1976. Although the first Confederate stamp was issued on October 16, 1861, the era of Confederate collecting began almost a year before when, on December 20, 1860, South Carolina became the first of 13 Southern states to seceded from the Union. Afraid that newly-elected President Abraham Lincoln would abolish slavery and drastically alter the way of life in the rural South, six other states quickly followed South Carolina's lead. Then in February of 1861, delegates from Alabama, Florida, Georgia, Louisiana, Mississippi, South Carolina, and Texas assembled at Montgomery, Alabama to form the Confederate States of America (C.S.A.). Jefferson Davis of Mississippi and Alexander Stephens of Georgia were elected president and vice-president. In the early morning hours of April 12, 1861 the first shot of the Civil War was fired by a Confederate battery in Charleston, South Carolina. After the Confederates captured the Union stronghold, Lincoln called for 75,000 volunteers to serve for three months to suppress the rebellion. It was an optimistic plea. Civil War raged throughout the nation for a full four years. Called upon to raise arms against their Southern sisters, Virginia, Arkansas, North Carolina, and Tennessee joined the Confederacy. 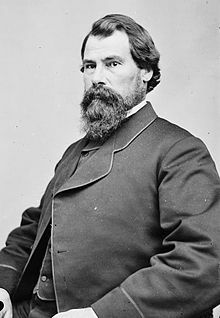 Although Kentucky and Missouri both remained in the Union, secessionist groups set up rival governments that sent delegates to the Confederate Congress. Technically, only 11 states joined the Confederacy, but the Confederate flag, with a total of 13 stars, included the last two. The Confederacy, no longer part of the Union, solved the problem of moving the mail by creating its own postal service. The C.S.A. Post Office Department was instituted on February 21, 1861. John Henninger Reagan of Texas was appointed Postmaster General two weeks later. On June 1, 1861, postal service between the warring North and South was suspended. Reagan was a masterful executive. Under his supervision, the Department actually made a profit. This was an incredible achievement, especially in view of conditions in the wartime South. Even the Union officials were impressed. In 1865, after the war had ended, Reagan was asked to assume responsibilities in the post-war U.S. Post Office Department. He declined. The C.S.A. Post Office had to provide its citizens with stamps. Less than a month after his appointment, Reagan ran ads in both Southern and Northern newspapers asking for sealed proposals from printing firms desiring the account. The Department received bids from companies in Philadelphia, New York, Baltimore and Newark as well as New Orleans and Richmond. After war commenced at Fort Sumter, it was evident that the contract should go to a Southern firm. The Department settled on the modest Richmond lithographers, Hoyer & Ludwig. The first Confederate issue was placed in circulation in October - five months after postal service between the North and South had been suspended. In the meantime, postmasters throughout the seceded states were directed to use temporary substitutes. Until adhesive stamps were provided by the Confederate government, some postmasters reverted to the pre-stamp period practice of handstamping the word "PAID" with the appropriate rate. This procedure had been obsolete since 1847, when the first U.S. stamp was issued. Other postmasters decided to design their own personal adhesives for their towns. Some of these included the postmaster's name as well as the town of origin and the postage rate. They were often printed at nearby newspaper or printing offices. These stamps are known to collectors as "Postmaster Provisionals", so called because they were used "provisionally", until the first Confederate general issue appeared. In some circles, Postmaster Provisionals are referred to as "locals", since they were intended only for use from the town in which they were issued. When postal service between the North and South ended, heavy business was created for the express companies. These agencies carried mail across the lines for nearly two months before the U.S. Post Office Department ordered an end to such traffic, effective August 26, 1861. Thereafter, mail had to be sent by Flag-of-Truce, although express companies continued to do some illegal business. To send a piece of correspondence by express carrier, a sealed and addressed letter with 15c to 25c was enclosed in a second envelope. This package was sent to the nearest express office for forwarding. Part of this amount paid for the postage, and the balance was the company's fee. The major express companies were Adams Express, American Letter Express, Cushing Pony Express, Southern Express, and Pioneer Express. In 1861, the postage rate in the U.S. was 3c per piece. 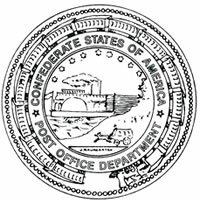 When mail service between the North and the South ended, the Confederacy instituted a higher rate, 5c per half ounce on letters traveling a distance of under 500 miles. This 5c rate was doubled for distances over 500 miles. After July 1, 1862, the postage rate was raised to 10c for all distances. A 2c rate covered circulars and drop letters. Drop letters were those which were posted, then placed in a post office or "charge box" for pickup. Few people enjoyed the privilege of street delivery, and citizens almost always fetched their mail from the post office themselves. Indeed, the vast majority of Confederate covers are addressed to a person in a city with no street address noted. Frequently mail was addressed "in care of" a third party. If street delivery was available and so desired, an extra charge was added to the regular postage. Three printing processes were employed in stamp production during the 19th century: lithography, typography, and engraving. Among stamp-issuing governments, only the Confederate States of America, in the four years of its short existence, employed all three. Hoyer & Ludwig, the Richmond lithographers, were neither experienced in stamp printing nor equipped for the job. The scarcity of printing stones forced the firm to recycle each stone after completion of an order, resulting in a new transfer whenever an order for stamps was received from the Confederate Post Office. In addition, inks were mixed in small quantities causing a wide inconsistency of shades. As a result, the lithographed stamps of the Confederacy present an intriguing challenge to philatelists. The first Confederate issue, a 5c green imperforate bearing the portrait of President Jefferson Davis, appeared on October 16, 1861. Davis was the first living President to appear on a postage stamp. In the absence of radio, television, and lavishly illustrated publications, the postage stamp was looked upon as the best means for introducing the leader of the newly-formed Confederacy to his constituency. As soon as a product of higher quality could be obtained, Hoyer & Ludwig lost the commission. The well known firm of Thomas De La Rue & Co. of London was contracted to supply the Confederacy with plates and enough stamps to fill the need until a local house could assume productions. The 12 million 5c blue stamps produced by De La Rue & Co. picturing Davis were designated "London prints". (Scott #6) Archer & Daly of Richmond made inferior copies from the De La Rue plates that are called "local prints". (Scott #7) A 1c Orange issue of John Calhoun (Scott #14) was produced but never put to use. During the first two years of the war, necessity forced Postmaster General Reagan to use lithographed and typographed stamps,rather than the superior steel-plate printed stamps used by the Union. The firm of Archer & Daly was awarded the contract and produced six engraved stamps in 1863 (Scott CSA 8-13). The first was a 2c brown-red stamp of Andrew Jackson. The next four were 10c blues of Davis. The last was a 20c green of George Washington. When Richmond was threatened with capture in 1864, the printing of Confederate currency and stamps was transferred inland to Columbia, South Carolina. Then Sherman set the torch to Columbia on February 17, 1865. The devoted employees of the Keatinge & Ball firm dumped the plates into the Congaree River. The markings on envelopes mailed by Southern citizens during the Civil War period reveal fascinating historical data. Prisoner-of-War and Flag- of-Truce covers give clues to the destinies of individuals involved in the war. Patriotic covers, illustrated with political themes, capture the sentiments of the time. Blockade-run covers allow the collector to share in the intrigue and danger in the South's strivings to maintain contact with the outside world. Turned covers testify to the ingenuity of the Southern citizens. Prisoners' and Flag-of-Truce through-the-lines covers have always formed an important part of Confederate philately. The markings on covers from captives of the Confederacy bear witness to the South's well organized postal service. A prisoner's cover was usually docketed with the prisoner's name, rank, and company. 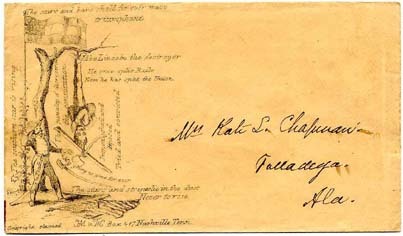 The marking, "Examined", on the face of the cover noted the letter's perusal by prison officials. On occasion, a single envelope bore the stamps and postal markings of both sides, North and South. These covers are very rare and eagerly sought after by collectors. With a bit of research, Confederate collectors can discover many fascinating facts about the covers they own. By writing to the National Archives in Washington, D.C. and supplying the name, rank, and company of a soldier, his entire photocopied file can be obtained for a small fee. In this manner, a collector can explore the history behind his find. Soldiers' covers are of a similar human interest. Early in the war, a resolution was passed allowing soldiers to send their letters "due", since it was difficult to obtain stamps in the field. The recipient paid the postage at the receiving end. Soldiers were required to identify such covers with their name, rank and company, which of course delights the collector-researcher of today. Often these soldiers' covers had traveled to and from historic military addresses in care of now famous generals. The Civil War period was one of high emotion, emotion clearly displayed on the colorful covers known as "Patriotics". Citizens expressed their political ideology by using envelopes decorated with flags, portraits, slogans, cartoons, and battle scenes. The custom originated in the North where printers found that envelopes boasting these designs were immensely popular. Soon a large part of American correspondence was being moved in this picturesque way. The South lacked the North's industrialized advantages and was short of supplies, so Confederate patriotics are rare and valued indeed. "Hear the Northern thunders mutter! Send them back your firm defiance! Stamp upon the accurs'd alliance!" But keep your powder dry." now he has split the Union. In April of 1861, the U.S. Navy formed a blockade of Southern ports which lasted the duration of the war. This blockade effectively strangled the Confederacy, and was largely responsible for the Union's victory over the seceded states. Blockade running became an enormous naval industry. The principal transfer points were Nassau and Bermuda in the West Indies. The captain's fee was a minimal 2c - a pittance considering the risk involved. His profit, of course, was derived not from the mails, but from the high priced goods he smuggled in from abroad. When Union forces gained control of the Mississippi River, the western Confederacy was separated from its sisters in the east. The conveyance of mail between the divided territories became an extremely dangerous proposition. Trans-Mississippi blockade-run covers are often water stained because of the perilous journey they endured. Most often, they were carried across the river in half sunken boats in the dead of night. The 40c rate such delivery commanded emphasizes the hazards involved for the mail carrier. Southerners, isolated from world markets by Union Navy blockades, experienced shortages of almost every kind of commodity. Paper became almost unobtainable toward the close of the war. As a result, every available scrap with sufficient writing space was pressed into service creating a collecting category called "adversity covers". Turned covers were one of the first signs of the growing paper shortage. Envelopes from previous correspondence were carefully turned inside out, regummed, and used again. Sometimes a single envelope was reused three or four times before the sheer weakness of its folds forced its retirement. The previous stamp was either removed or covered with a new one. As paper grew more and more scarce, people began to use old stocks of wallpaper to fashion the unusual wallpaper envelopes so popular with collectors today. It is a Confederate collector's second nature to look on the inside of a cover for more exciting details than those found on the outside. Not only wallpaper, but absolutely any sheet of paper with sufficient blank space for an address was used. Books were stripped of their flyleaves and title pages to supply letter paper and material for homemade envelopes. Tax receipts, wrapping paper, election ballots, bank checks, insurance blanks, military requisitions, religious tracts, accounting forms and music sheets were just some of the alternative sources. Toward the end of the war, the adhesive quality of gum on stamps deteriorated. Some ingenious souls solved this problem by using needle and thread to fasten the stamps to covers. This practice was extremely rare, and a genuine example would fetch an incredible price at auction today. Civil War ended on April 9, 1865, when the Army of Northern Virginia surrendered and the Confederate States of America was dissolved. The South was forced to yield to the superior might of the industrialized North. For Confederate philatelists, the story of this historic conflict lives in their valued collections. The many colorful categories of Confederate collecting, from the printing of general issues to the travels of covers, provide a constant source of fun and adventure.